The Dividist Papers: President Jed Bartlett Endorses Divided Government. President Jed Bartlett Endorses Divided Government. Hat tip to my sister (RAC) who pointed me to this video clip from "The West Wing." She was a big fan of the show, I never watched it. In this video the clip introduces a fundamental concept of Divided Government, the founding father's intent to insure that minority opinion is always represented, and ultimately points to a way to vote in the 2008 presidential election. Or - It would - if the election had not already been decided. This episode originally aired on October 30, 2002, a few days before the midterm election in GWB's first term. The Republicans held majorities in both houses of the legislature and the presidency. They were about to expand their majorities. Liberals and Democrats were justifiably concerned that their minority voice was not being heard. Hence the sentiment expressed by the West Wing writers and delivered convincingly by Martin Sheen as Jed Bartlett. 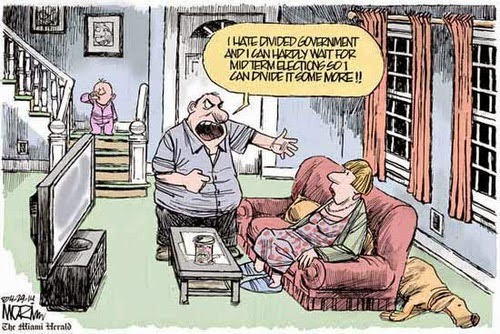 A divided government sounded like a pretty good idea to Democrats at the time. It was. Unfortunately the American electorate disagreed, leading to a continuation of one party rule and more disastrous decisions. 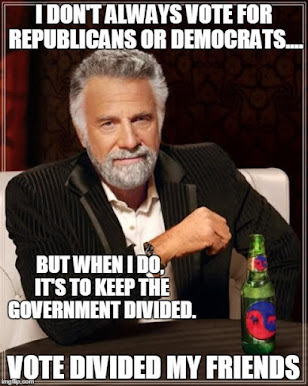 Divided Government is still a good idea, but today only Republicans seem to think so. Funny how that works. I got back from my fall family fishing trip to learn that we have adopted corporate welfare, socialism and big government centralized planning as the core drivers for our economy in America. Huh. Apparently, the new American Five Year Economic Plan is to be administered by fiat from an appointed banking Czar. That should work out well. I also learned that we have selected a new President. Apparently I missed the election, but from everything I am reading, it is all over and Barack Obama is indeed our new Dear Leader, and songs of praise are being sung across the land. I guess that is appropriate, since his acceptance speech was a litany of old liberal big government bromides. Who better to finish the job that GWB started and march us into the new millennium of a glorious American workers paradise? It looks like Barack Obama will indeed succeed in uniting Americans of every political stripe the left with the far left and maybe even bring in the moderate left, leaving only fiscal conservatives and limited government advocates without a voice or any practical representation in Washington. But that is ok, since we will certainly get new taxes without that representation. Kind of nostalgic. Since we have a new President leading another One Party Government for the next two years at least, I thought I should assess where the impending One Party Rule disaster will fit in the spectrum of Great One Party Rule disasters of the past. Since everyone tells me it is a blowout, I will assume my worst fears are to be realized, and the Dems will get to a 60-40 filibuster proof majority in the Senate, and a 100 seat majority in the House. Barack Obama fits in between Jimmy Carter and George W. Bush in these raw One Party Power Rankings. Somehow that seems appropriate. My casual observation is that the amount of damage done by One Party Rule correlates primarily to the number of years the Rule is in place, and whether the party in power has a filibuster proof 60-40 majority. So there is some cause for hope that the damage can be limited in the next two years. [NOTE - I have not included the first two years of the Clinton and Eisenhower administrations, which both held narrow One Party majorities - they would be ranked 6 and 7 respectively]. Internment of Japanese-American citizens, Abuse of IRS and FBI power for political gain (FDR), Massive Expansion of Federal Government (FDR), Confiscation of gold from American citizens, Seizing Coal Mines and other business, NIRA and the National Recovery Administration to impose price controls, set production quotas and implement centralized control of the economy (later ruled unconstitutional), Federal seizure of control of state tideland oil resources, Attempted stacking of the Supreme Court, Broad expansion of Executive War Powers (FDR), Higher Taxes (FDR), Widespread political corruption, Korean War, Abuse of FBI and CIA power for political gain (LBJ). Massive expansion of Federal government size and scope (LBJ). Increasing Federal spending, waste and corruption(LBJ). Broad Expansion of Executive War Power (LBJ). Massive entitlement obligations, Higher Taxes (LBJ) Bay of Pigs, Vietnam, Gulf Of Tonkin Resolution. Expansion of Federal government size and scope (JC), massive increased Federal spending (JC). Increased taxes (JC), Iran Hostage Crisis and failed rescue attempt, Massive increase in Federal spending, waste, and corruption (GWB), Abuse of Justice Department power and FBI (GWB), Massive new entitlements (prescription drugs), giant new government bureaucracy (Homeland Security), acceptance of torturing prisoners and detainees, Surveillance of American citizens, gutting Habeas Corpus, Corporate welfare, weakening of the Rule of Law, Expansion of executive war powers, Iraq Occupation... sigh... I could go on. This is, of course, by no means comprehensive. I intended to put together a more complete list organized by the offending One Party Rulers with linked sources for all offenses, but the whole exercise seriously depressed me. Perhaps we'll revisit this at some unspecified time in the future. For now, I simply want to welcome our new Democratic Party Overlords and Dear Leader Barack Obama. Hmm. I just learned that there is another debate coming up in a few hours. I don't understand why they are going ahead with this since the election is already a foregone conclusion. It seems kind of pointless. However, since this is the last one, I will attempt to get my act together for the very last of the 2008 Election "Live Blogging the Live Bloggers Blogging the Debates" series. Stay tuned. UPDATE: I understand the tables are not readable. I don't know what happened. They were fine in the compose window and preview. Try highlighting the tables to read the numbers. I'll fix over the next few days, but don't have time now. It's always possible that events -- such as a recession -- would temper some of these ambitions. Republicans also feared the worst in 1993 when Democrats ran the entire government, but it didn't turn out that way. On the other hand, Bob Dole then had 43 GOP Senators to support a filibuster, and the entire Democratic Party has since moved sharply to the left. Mr. Obama's agenda is far more liberal than Bill Clinton's was in 1992, and the Southern Democrats who killed Al Gore's BTU tax and modified liberal ambitions are long gone. In both 1933 and 1965, liberal majorities imposed vast expansions of government that have never been repealed, and the current financial panic may give today's left another pretext to return to those heydays of welfare-state liberalism. Americans voting for "change" should know they may get far more than they ever imagined." Let me repeat, DWSUWF welcomes our new Democratic Party Overlords. Technorati tags: West Wing, 2008 election, John McCain, Divided Government , Republican, Democrat, libertarian, Barack Obama , Jed Bartlett .